There seem to be a lot of things to think about when just beginning to paint. What medium? How to begin? Starting with a water-based medium such as acrylic, watercolor, or gouache is easiest. You don't have to deal with toxic solvents, and cleanup is much easier. 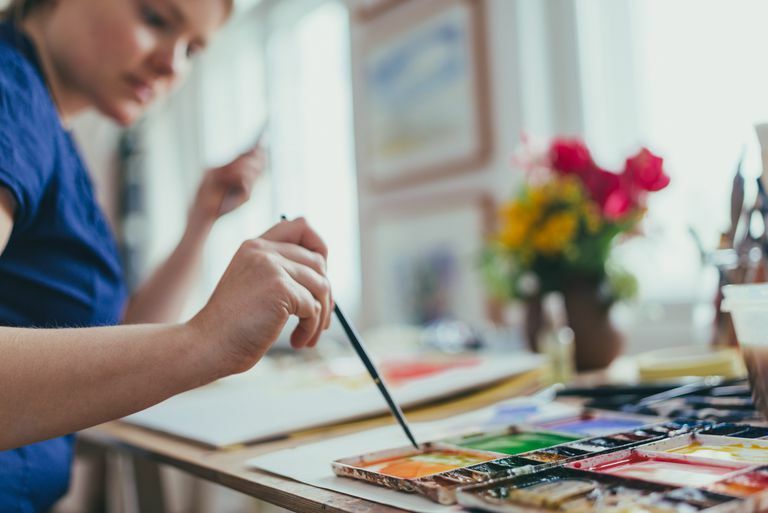 The main difference between acrylic and watercolor or gouache is that acrylic dries hard and is therefore easy to paint over and work in layers. Watercolor and gouache remain active, meaning that underlying layers of paint can be lifted off or blended when water or a new color is applied. Here are some suggestions as to what materials to use and how to get started. What you choose depends primarily on your own preferences, or maybe what you already have on hand. Acrylic is a very versatile, durable, and forgiving medium. Acrylics can be used thinly, like watercolor, or more thickly, like oil paint. They dry fast and can be painted over easily. They are water-soluble, requiring only water to thin the paint and, along with soap, to clean the brushes. There is a wide range of acrylic mediums for different effects. For example, if you want a slower drying time you can add a retarding medium to the paint, for thicker paint, add a gel. There are different grades of paint for students or for professional artists. Professional grade paints contain more pigment, but student grade is fine to start out with and easier on your budget. "Painting with Acrylic for the Beginner"
Watercolor is also a good place to start if you are new to painting and perhaps less of an investment. Buy a set of watercolor pans, or some tubes of color to get started. You can choose whether or not to use white with watercolor. Traditionally the white of the watercolor paper serves as the lightest light in your composition when you use transparent watercolor and you work from light to dark. "Watercolor Painting Tips for Beginners"
Gouache paint is an opaque watercolor and allows you to work from dark to light on a light surface as you would with acrylic paint. You can also mix Chinese White with watercolors to make the colors opaque. Acrylic: Start with just a few colors in order to learn how to paint values and get the feel of the paint before adding the complexity of color. Begin with a monochrome painting of Mars or Ivory Black, Titanium White, and one other color. Alternatively, start with a limited palette of Burnt Sienna, Ultramarine Blue, and Titanium White. This gives you warm and cool tones while also allowing you to create a full range of values. You could also buy a starter set which generally includes a limited palette of the three primary colors plus Titanium White, green, and an earth color such as Yellow Ochre. From a few colors, you can make an endless array of hues. You can add to this basic color palette in time as you progress and want to try different colors. Watercolor or Gouache: As with acrylic, start with a limited palette. Ultramarine Blue, Burnt Sienna, and white (whether Chinese White or the white of the paper) will give you the ability to focus on capturing the values in your composition. Once you conquer that you can expand your color palette. Read "10 Limited Color Palettes" for some ideas as to how to get started with some basic color palettes. One of the nice things about acrylics is that you can paint on many different surfaces. 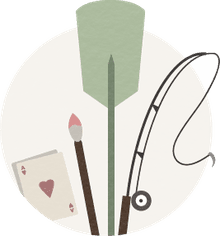 Primed canvas panels are great because they are already primed, they are rigid and therefore easy to rest on an easel or your lap if need be, they are light-weight, and not too expensive. For an acid-free archival board try Ampersand Claybord. Other inexpensive options are paper on a board or pad, cardboard, wood, or masonite. And of course, there is always the traditional stretched canvas. The paint goes on more smoothly if you also prime these with gesso first, but it is not necessary with acrylic. For watercolor or gouache, there are different weights and textures of watercolor paper. Buy individual sheets or get a pad, or block, which is easy to carry around. You can also try Ampersand Claybord or Watercolor Board. Read "How to Choose a Watercolor Paper" to help you determine which watercolor paper to select. Brushes come in different sizes and shapes. Brushes are sized by number but vary by manufacturer. Buy a brush with synthetic bristles about an inch wide. Often this is a #12. Then choose two smaller sizes. You could also buy a less expensive starter pack to see what sizes and shapes of brushes you like. Ultimately, though, money spent on good brushes is well worth it since they tend to keep their shape better and not to shed as you're using them, leaving unwanted hairs in your painting. Generally, you want to start out with your bigger brushes and save your smaller brushes for detail. Brushes for watercolor are softer for a more fluid paint. Try a starter set to experiment with different brushes. A good #8 round red sable watercolor brush is very useful. Otherwise, buy the best synthetic brushes you can afford. A #4 round for detail, a flat 2" brush for washes, and an angled flat should get you off to a good start. You just need a few more things: containers for water (i.e., large yogurt containers), rags, and paper towel for wiping and drying your brushes, a spray bottle to keep your acrylic paints from drying out, paper plates or disposable palette paper on which to lay out and mix your colors, a plastic palette knife to mix acrylic colors, tape or bulldog clips to secure your paper to a board, and an easel or table for support. You're ready to start painting!